In Hort Alba Garcés not stop to introduce and adapt the fields to the exigencies of our clients, for that reason we are of congratulations, after a few years taking care of the trees of persimmons that we plant with all our affection, we can begin to work with them sending our customers, Persimon Khaki, an orange to reddish fruit depending on the state of maturation. It is necessary to emphasize of this fruit really receives the name Persimon Khaki (denomination of origin of the Shore of the Xuquer) by the way to present it to the client not by the variety. khakis are called Persimon, when they are consumed by the customer when they are hard, before they mature and remain very soft. This system achieves a texture and a hardness that is closer to an apple than the traditional and soft khaki. 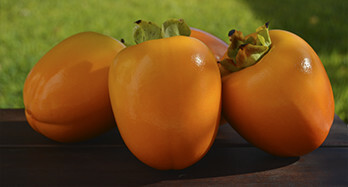 The persimmons are rich in antioxidants, have a high nutritional value have a lot of vitamin A and C, is an ideal fruit for people with diabetes and hypertension. Curiously, the Japanese legend says that the persimmon plant grew inside a crack that was produced by a samurai when he defeated a giant, and when he fell created the crack.